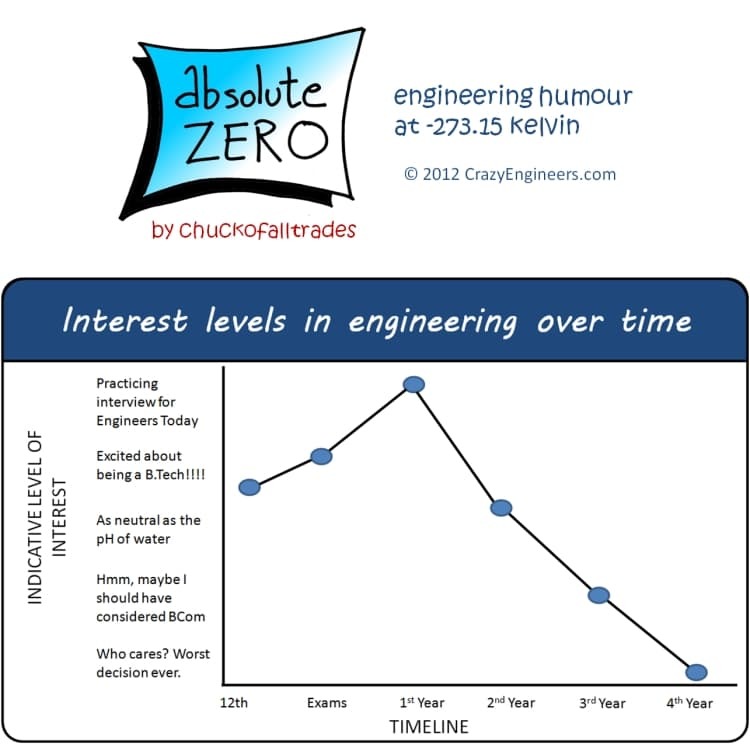 Our interest levels in engineering don't remain constant. From dreams of finding new proprietary methods of producing aldehydes and oil exploration to a steady stream of CAT books while learning rote answers to give the software interview guys, it's a trip. Some of us slog it out and become true engineers. Salute to you, chaps! The rest of us can refer this handy-dandy chart. The curve is a little different for me. It was "Who cares? the worst decision ever" in III year. Now my interest has peaked!  Frankly, I am so confused that I have no idea where do I plot my interest level in that chart. 1. Lack of clarity when applying: I've seen a lot of people, and I'm one of them, who is unaware about career choices and just goes along with engineering, and decide by their 3rd year what they really want to do. 2. The pedagogy itself: Like much of our school education, the emphasis seems to be on getting the subjects done with (faculty) and cramming 2 days before the exams to pass the exams (students). How much learning is imparted and how much is taken in? Zilch. What can be done for this to change? 1. Have a clearer career choice: even if this means debating with your parents who want you to be an engineer. The loss of sheen of IT companies should help in the long term in this regard (I'm not even getting into how IT has killed traditional engineering interest... Another comic for that). 3. Kill rote studying: The emphasis placed on rote studying in higher education is shocking. Who has time for concepts when all one can think of is mugging formulae? What, you think your supervisor is going to let you use the Darcy-Weishbach equation from memory while handling a mechanical flow worth crores? Give me a break, get real. In this age of technology and references, engineering should learn to embrace rather than to use archaic methods. Get students out for more internships. Let them see industry, and do things hands-on. These are the most exciting parts of engineering, not faking values in the lab so that your graph is of the correct shape. Sorry for a long post! Since past 100 -150 years we Indians are used to just going with the flow when it comes to career choices. In the days of our grandfathers everyone applied for post office jobs. Then in the age of our uncles everyone wished to get a job in a nationalised bank. In the days of our fathers everyone started aiming for Engineering. Now the buzzword is MBA. ...Hmm nice post Chuck! -  What!??  Mine is a cosine wave.